This is a very fancy bar and, incredibly, most of the times that I have been there it was very easy for me and my friends to find a comfortable sofa to sit. I am not a fancy person, but I do love fancy places that make you feel fine. The bar belongs to the Belem Altis Hotel & Spa and as usual nowadays in Lisbon, the old fashioned and heavy furnished hotel bars are becoming history, and 38º41′ is proof of that. 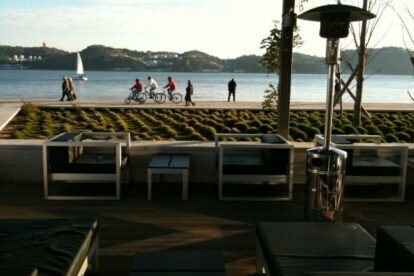 It’s a very trendy space to relax, with good ambient music and a wonderful and huge view to the Tagus River, as well to the bridge “25 de Abril”. 38º41′ , the name of the bar, are the coordinates of its location, which is between two of the most famous Lisbon landmarks: The Belem Tower and the Monument of the Discoveries. Yes, I always keep my eyes on them from the bar, a perfect luxury! They have just launched a new space, in the part facing the river, kind of budget. I enjoy going there to watch the sunset having a margarita, or follow the boats sailing along the Tagus river. They have good natural juices and smoothies, since I am not always in the mood for drinking alcohol. All in all, this is the perfect place, for me, to be with friends or with a book, and a lot of spare time, because, by the river, time really goes slow.